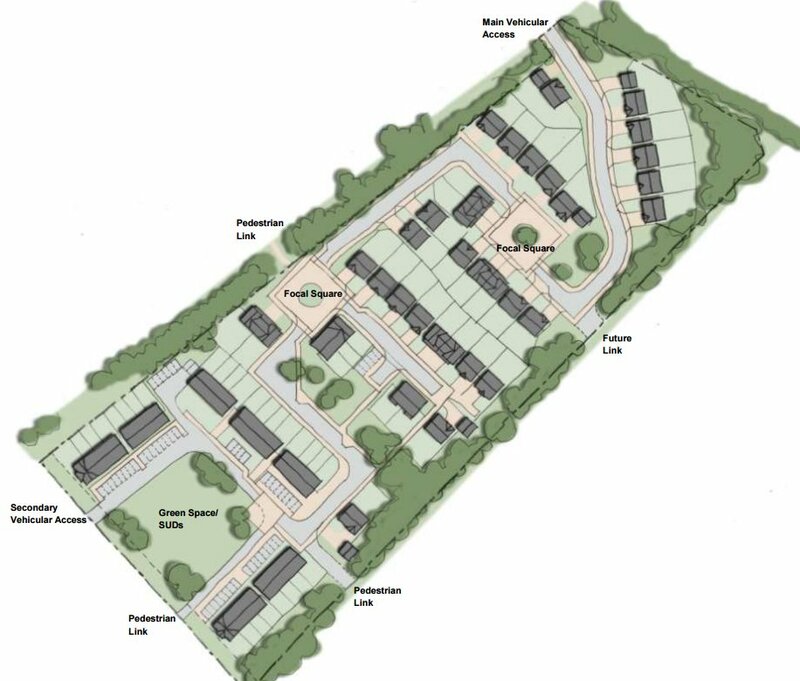 1.1 The Need The proposed development offers the potential to extend the existing development of family housing to the southeast of Kemnay in a structured and planned fashion. While development has been on-going for a number of years this Masterplan shows how the new development will integrate with the existing neighbourhood. The proposed development will provide much needed affordable housing for the town of Kemnay. 1.2 The Opportunity A Masterplan for the development presents an opportunity to draw existing and proposed areas together and take a holistic approach to the extension of the neighbourhood. A detailed planning application will follow agreement of the Masterplan. 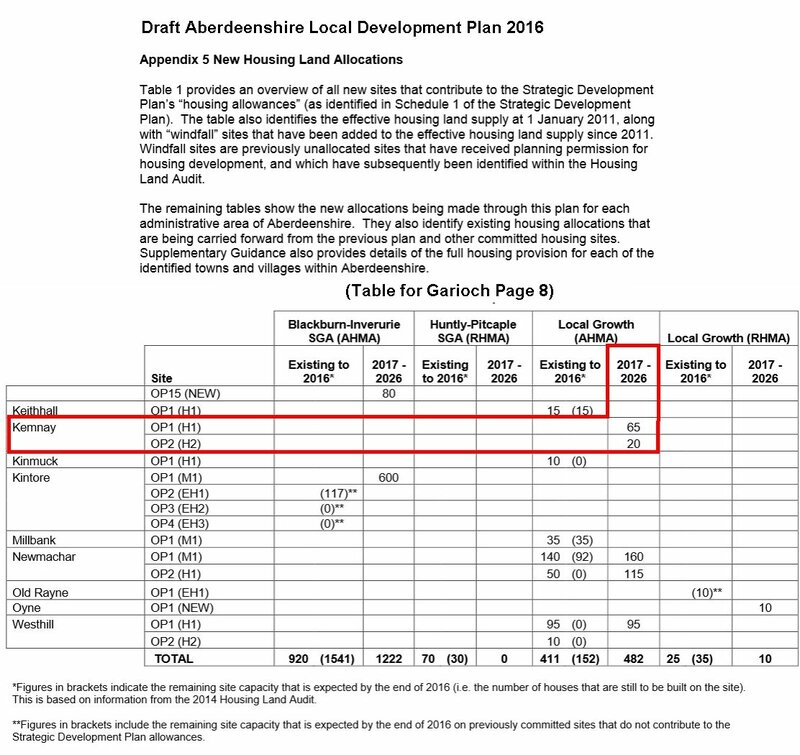 1.3 The Process The proposed site is part of an allocation in the current Aberdeenshire Local Development Plan (LDP). Proposals for the site were first developed in 2010 and put forward for Community Consultation in April 2011. Constraints in the local secondary education capacity prevented an application being made in the earlier Local Plan or the first phase of the current LDP. It is proposed that the site be developed in the second phase of the LDP post 2016, The new LDP requires a Masterplan be prepared and agreed for identified sites prior to the submission of a detailed planning application. 1.4 Community Consultation During preparation of the initial layout for the site a presentation was made to the local community Council by the client Barratt Homes North Scotland in early 2011. This was followed by a public presentation in the form of a drop in session was held on the 28th April 2011 in Kemnay Village Hall. Comments and feedback from this event were recorded and have informed the development of the Masterplan Layout. Following further development of the Masterplan proposals a further Consultation Event on the current Masterplan was held on Tuesday 18th February 2014. A full report of the process, comments, discussions and outcomes of the community consultation is included as Appendix 1 of this Masterplan submission. 2.1 Location The site at Bogbeth Road in Kemnay extends to 3.19 ha or thereby and is located to the south east of Kemnay. Kemnay is a small town located approximately 16 miles from Aberdeen City Centre. 3.2 Connectivity The Site is located within 10 minutes walk from the town centre and its facilities. The local park is within 5 minutes walk, as is the main bus route through Kemnay. The local primary school is located approximately 7 minutes walk from the site via the park. The local secondary school is approximately 20 minutes walk from the site. 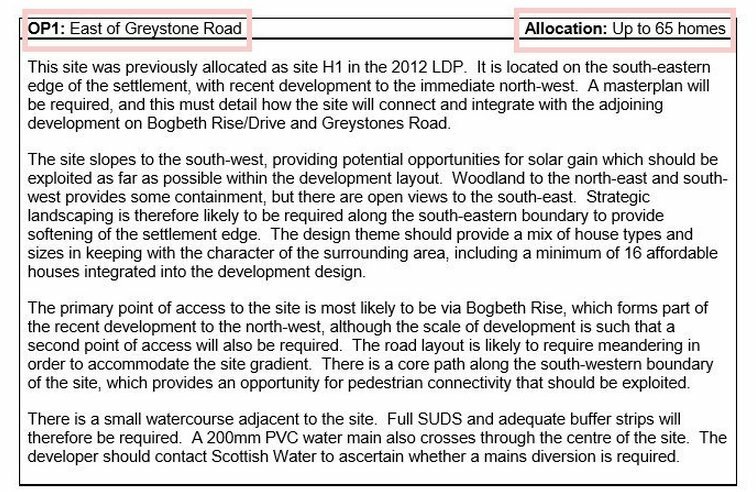 Access to the new development will be from Bogbeth Rise which is part of the previous development 2011 Barratt North Scotland. Limited access will also be required onto the existing unclassified road to the south west of the site. This is because the previous phase of development was taken from a single point of access with an emergency access to the development to the north. This development will take the overall numbers to a level where a second point of access will be required. 3.5 Transportation and Roads Within the context of the constraints of the site, access and connectivity will be a major factor in the design of the site to maximise both circulation and accessibility through the proposed and existing sites. The layout will be based on Designing Streets, with the utilisation of a variety of methods to control vehicle speeds, i.e. varying surface materials, placement of street furniture, and reduction in sight lines along with the sites natural requirements for tight horizontal and steep vertical geometry. The design will attempt to keep to a minimum the use of private cars and maximise the use of public transport systems, walking and cycling. Comment by webmaster: Kemnay is a rural community, the majority of working people commute to Aberdeen or Inverurie and we are served by a poor and inadequate bus service, so by far the majority of people commute by car. The Developer needs to take a look at the adjacent previously developed estate where it would appear that almost every household has at least two and sometimes three cars and in a number of instances cars are parked across pavements effectively blocking the footpath and forcing pedestrians, mothers with prams, children and wheelchair users on to the road. In reality there is a good probability that all households in the new development will have two cars … unless of course it is the intention of the Developer to insert a condition in the Deed Of Conditions limiting each household to just one car … but I doubt it? Part of the function of the new development will be to provide a second point of access to the existing development which will also mean the site itself will have two points of access, one off an extension to Bogbeth Rise and the major site access off Bogbeth Road. It is intended to enhance the movement along Bogbeth Road by providing additional passing places along and adjacent to the site frontage. 3.6 Drainage and Flooding Foul Drainage New gravity foul sewers will be provided to serve the development and these will be located within the proposed roads. The foul flows from this development will require to be pumped to a connection point within the Kemnay area which is to be agreed with Scottish Water. Individual houses and properties will each be connected to the foul sewers via a disconnection chamber. Sewers will be designed and installed in accordance with Sewers for Scotland, Second Edition, November 2007. Surface Water Drainage New gravity surface water sewers will be provided to serve the development and these will be located within the proposed roads, communal driveways and areas of open space. Individual houses and properties will each be connected to the surface water sewers via a disconnection chamber. All surface water flows will be directed to an extended detention basin located at the west of the site, which will provide treatment and attenuation. A grass conveyance swale will be positioned either upstream or downstream of the extended detention basin, which will provide further treatment and sediment removal. Surface water discharge from the site will be discharged at a controlled rate, via an off-site surface water sewer to the existing watercourse. The discharge point and the discharge rate is to be agreed with the local authority. Sewers and SUDS measures will be designed and installed in accordance with Sewers for Scotland, Second Edition, November 2007 and / or The SUDS Manual (CIRIA C697). 4.3 Connectivity and Street Hierarchy There is a single vehicular access to this site from Bogbeth Rise within the recently completed development. Site topography has influenced the main meandering street within the site which links from Bogbeth Rise to the private road to the south west. There are several pedestrian links from the site to the neighbouring development, adjacent green space and the unclassified road. Emergency Access is currently provided from Bogbeth Rise to the Glebe. However, the number of houses now being provided will require a secondary access point from the site to the unclassified road. It is anticipated that some form of upgrading will be required. 4.4 Residential Form The proposed development consists of a mix of house types ranging from 2 bedroom terraced houses to 4 bedroom detached houses providing for a variety of family sizes and a range of tenures in keeping with the character of the surrounding area. 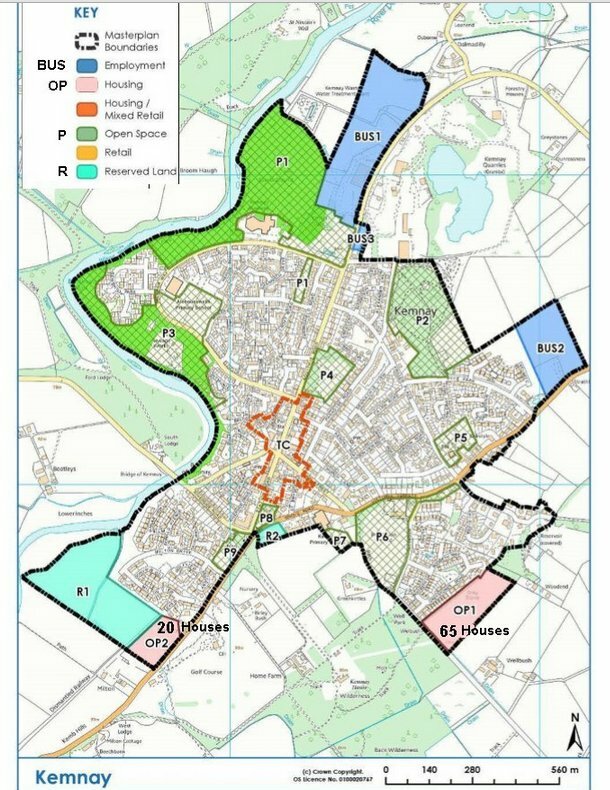 February 2014 Following the development of the Masterplan further Community Consultation was arranged to present the updated proposals. The event was advertised in the Inverurie Herald newspaper and posters displayed outside the village hall. The previous event in 2011 was advertised in the Evening Express newspaper and invitation letters sent to neighbours and other stakeholders. Comment by Webmaster: Why wasn’t a similar approach used in 2014? Why wasn’t the Community Council informed at least as a courtesy and they could have publicised it on the website. If the Developers had truly wanted publicise the event and encourage community input why wasn’t it advertised in the Newsletter which reaches every household? The Inverurie Herald is a weekly newspaper published on Thursday and the event took place on the following Wednesday, which is a very inefficient publicity timeline. Comment by Webmaster: Records indicate that Friendship Room was booked but the purpose for booking the room was NOT disclosed or advertised, which is very strange given that the purpose was “Community Consultation? It is hardly surprising that turnout was low given that it was mid week, Wednesday afternoon and early evening in February, it gets dark circa 4.00 pm, people wouldn’t see the posters, parents are collecting children from school or commuting home from work, no wonder turn out was low, why wasn’t the presentation on a Saturday? The event was poorly planned and the resultant poor turnout was a result of poor communications by the Developer either by design or inept organisation. The Community Council were effectively snubbed, which is contrary to the “spirit” of “community consultation” process. Why couldn’t the Developer at the very least sent a copy of the pdf “Masterplan” file to the Community Council either by post or email, as a courtesy? In effect the consultation exercise has little or no credibility. 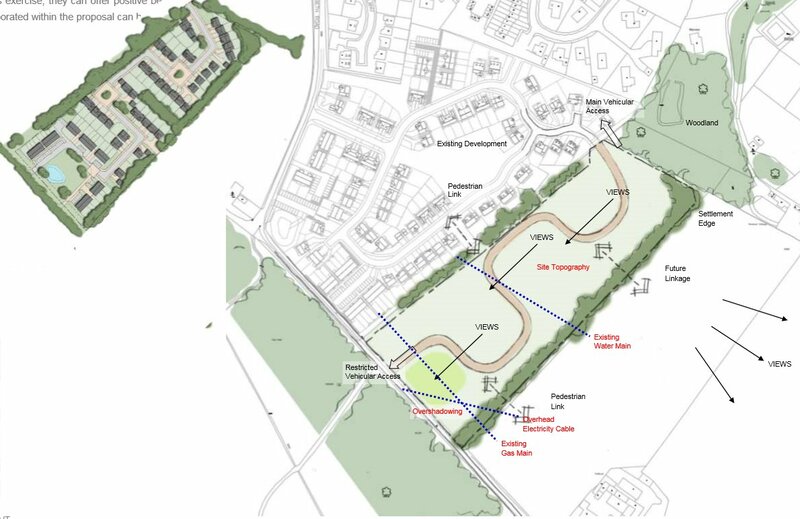 … however those who turned up were asked for their general comments and provided with comment forms with the following Questions: What do you think of the proposed Masterplan for the residential development? Do you have any comments on the open space provision in the layout? Do you have any comments on the links to the village centre, school or park? There was also space for general comments. The general comments received on the evening mostly related to the additional traffic coming through the existing development on Bogbeth Road and impact on the local primary school? Those who viewed the proposals had no adverse comments to make. There was a general acceptance that the site is likely to progress as it has been allocated in the Local Development Plan. The following images are the Boards which were displayed at the Presentation.